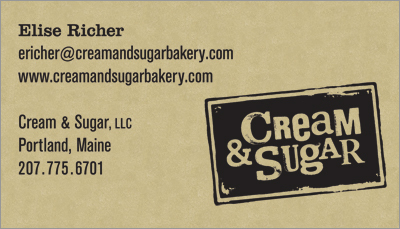 Cream & Sugar is baking business that creates home-style desserts and treats. Their products are like what your mother, father, or grandma would have made—only better. Therefore, their logo needed to have a hand-made, back-to-basics sensibility to it. To enhance their branding, all materials are printed on kraft paper–something that the food industry and craftspeople have used for generations.